When friends of mine moved across the country last summer from Halifax to Regina they opted to drive the distance, primarily because they were moving with their dog, a sweet shepherd-mix named Khaleesi. The challenge for my friends was to find hotels that would welcome them along the way. In the course of their journey they stayed in seven hotels from Edmundston, N.B through to Toronto, Sault Ste. Marie, Thunder Bay, Winnipeg, MB, and Regina, SK, where they checked into the Residence Inn Marriott for five days while they waited for their house to be ready. The hotel chains they found to be most dog-friendly were Four Points Sheraton, Super 8, Residence Inn Marriott and Marriott’s Town Place Suites. At the Durham College/UOIT Residence and Conference Centre in Oshawa, guests staying with dogs are provided with a door tag indicating a pet is staying in the unit to alert housekeeping staff. When staying in hotels with dogs, always make sure you understand the pet policy upfront to avoid unexpected and unwelcome additional charges at checkout. For example, the Hotel Residence One King West in Toronto, located right at King Street and Yonge Street, allows dogs but their website says only those that weigh up to 20 1b are permitted and their pet policy indicates they will charge a $100 “deep cleaning” fee to your bill. My friends stayed there with their medium-sized dog and had no issues or extra charges but policies do change depending on demand. Most hotels will also ask you to sign a waiver at check-in and outline a (long) list of things you will be responsible for if your dog does any damage to the room. Hotels such as the Westin also stipulate you can be subject to a $200 fee for non-compliance of any of the rules outlined on their websites. The Westin chain also markets their dog-friendly accommodation but has limitations on size and number. For example, the Westin Harbour Castle in Toronto promotes the availability of its “Heavenly Dog Bed” and Doggie Welcome Kit, however, dogs must be under 40 lbs and more than six months old. There is also a limit of two dogs per room. By far, our best experience I have had is with Choice Hotels, which include Comfort and Quality Inn hotels. The chain offers more than 2,500 pet-friendly hotels. If you have a Canadian Tire Roadside Assistance membership you get preferred rates. One of the best experiences we had was staying at the Durham College/University of Ontario Institute of Technology Residence and Conference Centre in Oshawa. In the summer many post-secondary institutions open their residences to paying guests. We were travelling for a dog show and were able to stay in a two-bedroom suite equipped with kitchenette and bathroom for about $100 per night. It featured free Wi-Fi, 24-hour coffee and tea service, a fitness centre as well as great green space to walk the dogs. Upon check-in we were provided with a door tag to notify housekeeping staff that a pet was in the room. Not all dogs love elevators so I always ask for rooms on the main level, ideally with a door right out to the parking lot or green space. This makes it easier for late night or early morning walks with the dogs. Never leave your dog unattended in a hotel room. For many hotels this is one of the first rules they ask you to sign off on, but it’s also just common sense. Why would you leave your dog in an unfamiliar place and expect things to go well? If your dog is crate trained it’s a good idea to take their crate into the hotel room to make them feel more at home as well as minimize the amount of dog hair that accumulates on the carpet which will reduce the chance you might be charged a clean up fee. Soft-sided crates fold down for easy storage and unzip on the top for added air circulation during the night. 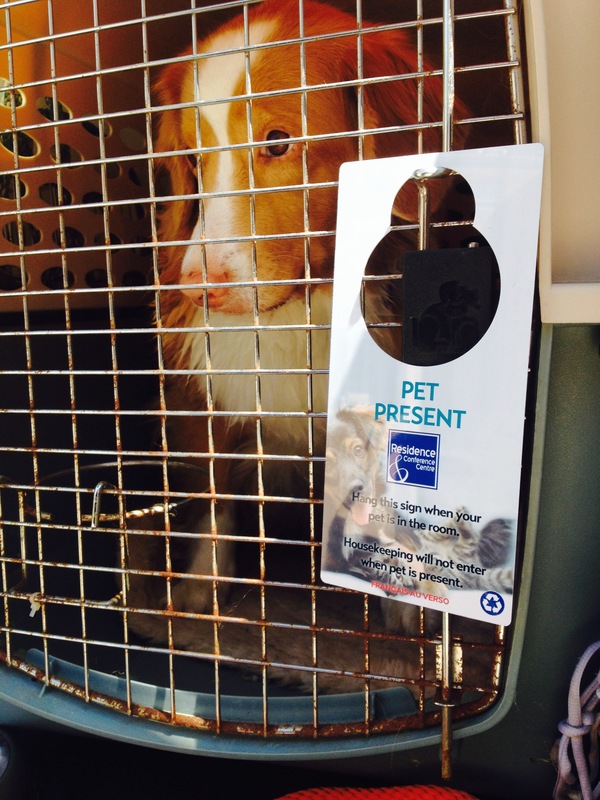 If you don’t travel with crates consider something like a collapsible travel pet playpen. Pack a few extra small towels of our own to put down for the dogs to lay on and feed them in the bathroom to avoid any spilling on the hotel room carpeting. Take your dogs along on a trip is fun and staying in a hotel can be fun. Don’t let it be a stressful experience by failing to prepare. Despite the increase in people wanting to travel with their dogs, many hotels are starting to say “no pets allowed.” Make sure those who do continue to do so by being a responsible traveller. 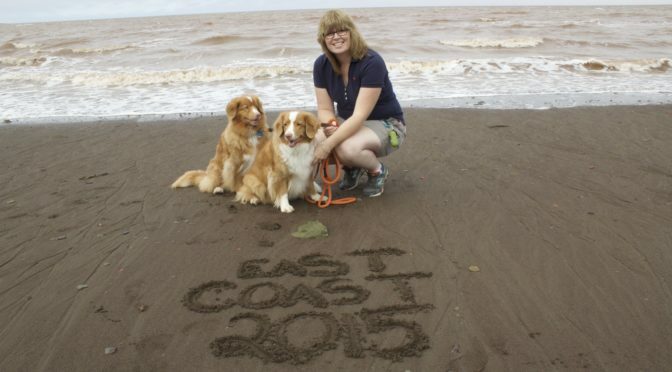 Three years ago we packed up our two Nova Scotia Duck Tolling Retrievers and hit the road for Nova Scotia. Yes, we were taking them to the home province! We had managed to book a number of hotels and inns to stay along the way. It was a great experience but what I learned along the way was that not all “pet-friendly” accommodation is created equal. In a time when the pet industry is booming and people are spending a good portion of their discretionary income on their canine and feline companions, you would think travelling with pets would be easy. There are certainly many options available but when you have more than one dog it can be a challenge. 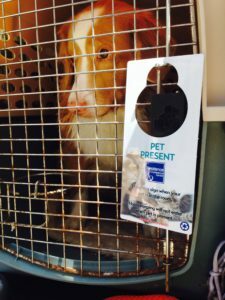 This blog will explore the options available and the fun things you can do on the road with your fur friends.